I baked this cheesecake sometime last year and posted the recipe only on Instagram. Since then, I’ve been wanting to rebake this for the blog and only managed to do so a few weeks back when I needed to clear my refrigerator for this 3-week holiday – I think I’ve never seen my refrigerator so empty before! 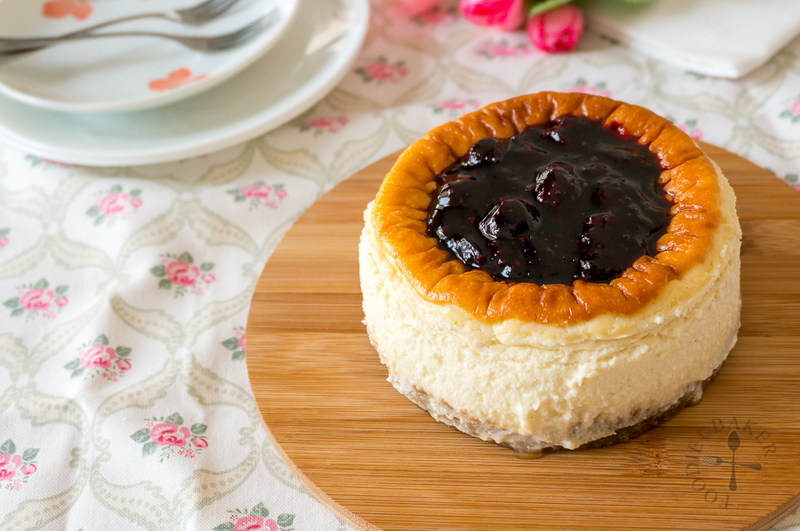 Technically this is not really a blueberry-blueberry cheesecake – there is no blueberry inside the cheesecake itself. The cheesecake is flavoured with lemon and vanilla instead. 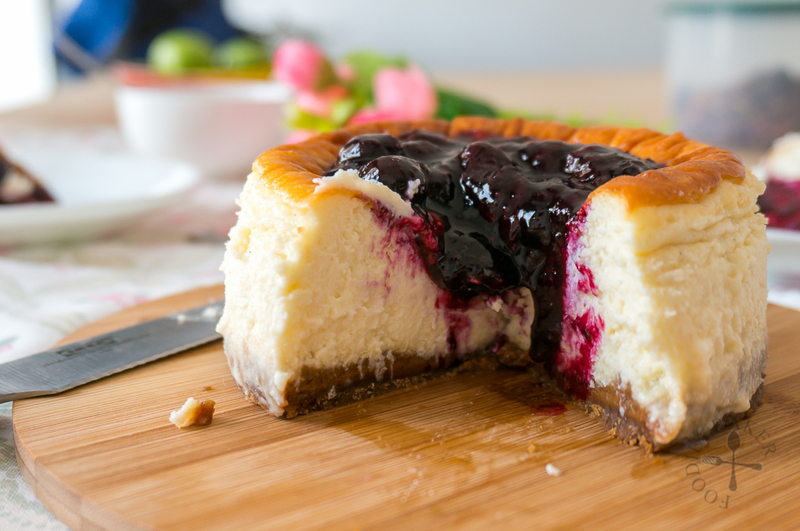 The blueberry comes in the form of compote spooned on top of the cheesecake. P.S. This is a scheduled post as I’m currently away on holiday! I’ve scheduled a few more while I’m away, so do subscribe to the mailing list, or follow my Facebook Page so that you will never miss a recipe or travelogue! Thank you for visiting and leaving behind sweet comments! My apologies as I won’t be able to visit your blogs during this period. Do check out my Instagram (@foodiebaker) to see what I am up to in Iceland! During my first attempt in baking this, I baked the cheesecake in a water bath – the top is smooth and not browned at all. The second time I baked it, I halved the recipe, used caramelised biscuits as the base, tub cream cheese instead of the usual block cream cheese and skipped the water bath (laziness at its peak). The cheesecake rose and browned during baking then sank while cooling, creating a nice cavity to hold the blueberry compote. 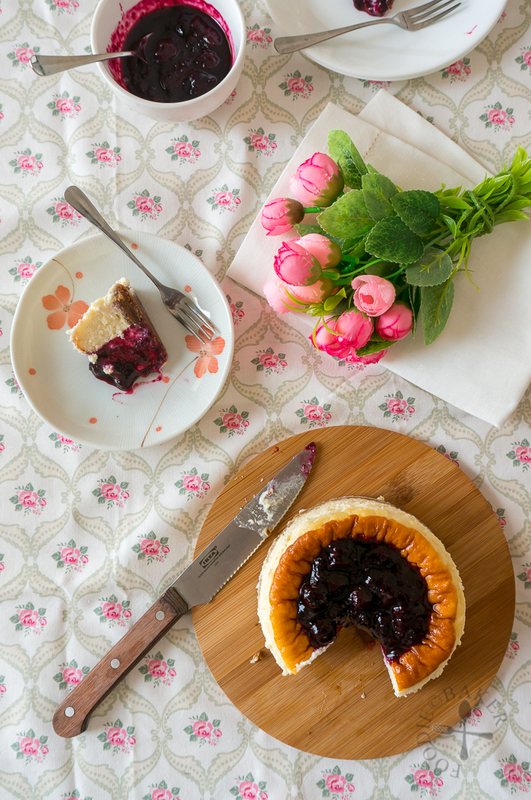 As tub cream cheese is softer than regular block cream cheese, the resulting cheesecake is also softer in texture. In terms of looks, I think I prefer the second cheesecake – some will say it’s sacrilegious for cheesecake to brown but I guess it’s really personal preference. I’m not sure if the browning is a result of the lack of water bath, but I guess that’s something I have to experiment when I’m back! Both cheesecakes did not crack and even if they did crack, the blueberry compote will cover it up easily. In terms of taste, I found the cheesecake a tad too soft for me but my friends were okay with it. I think I would still use the block cream cheese if I have the chance to get it. Block cream cheese, being imported from overseas, are more expensive than those tub ones that are produced locally. I only get them when they are on sale – hopefully they are on sale again soon! If you don’t like blueberries, you can always swap them out with strawberries, raspberries, blackberries… you can even do a mix of them! Blueberries here are insanely pricey – SGD 10 for 125 grams! So when I saw some on sale in Denmark at only SGD 7 for 500 grams, I bought a packet and freeze them when I reached back. Now I can make blueberry cakes, muffins, cheesecakes anytime I want! Okay enough blabber, here’s how to make the cheesecake! 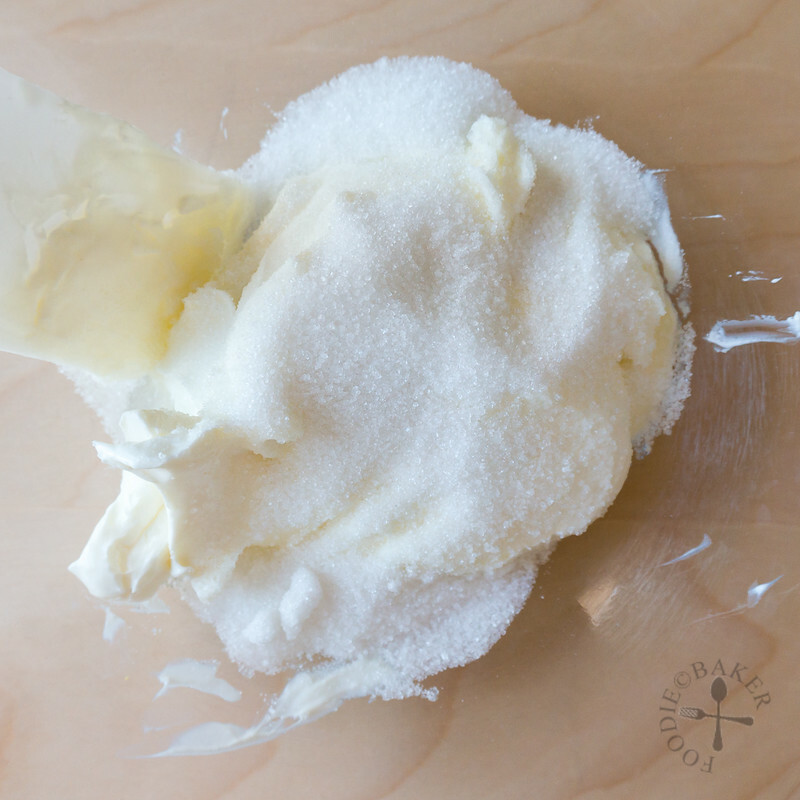 3) Beat cream cheese and sugar on low speed to mix them together. 4) Beat in egg and sour cream. 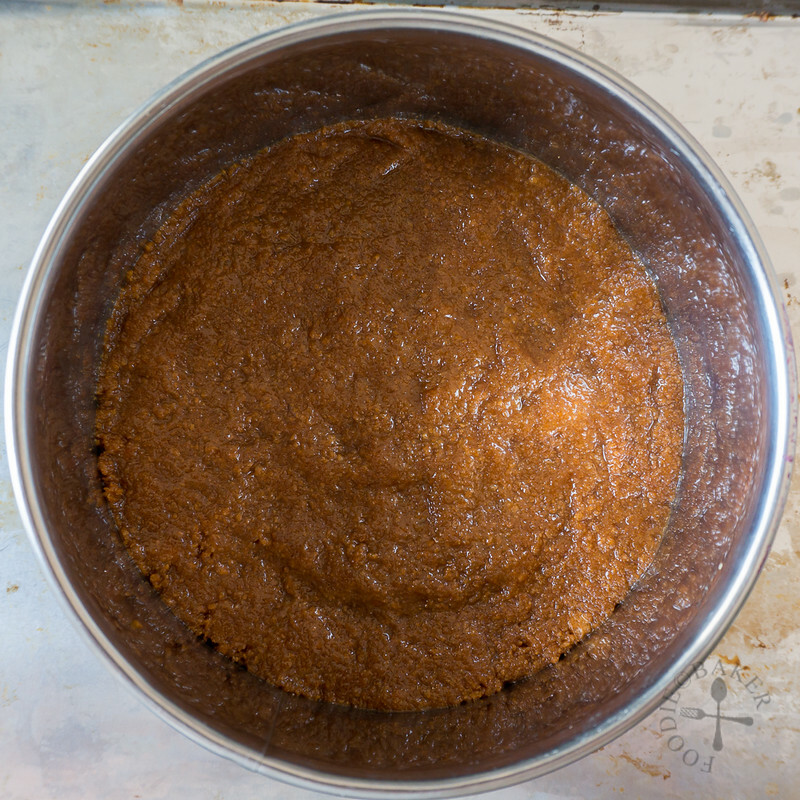 If the batter has lumps, strain the mixture through a sieve into another clean mixing bowl. 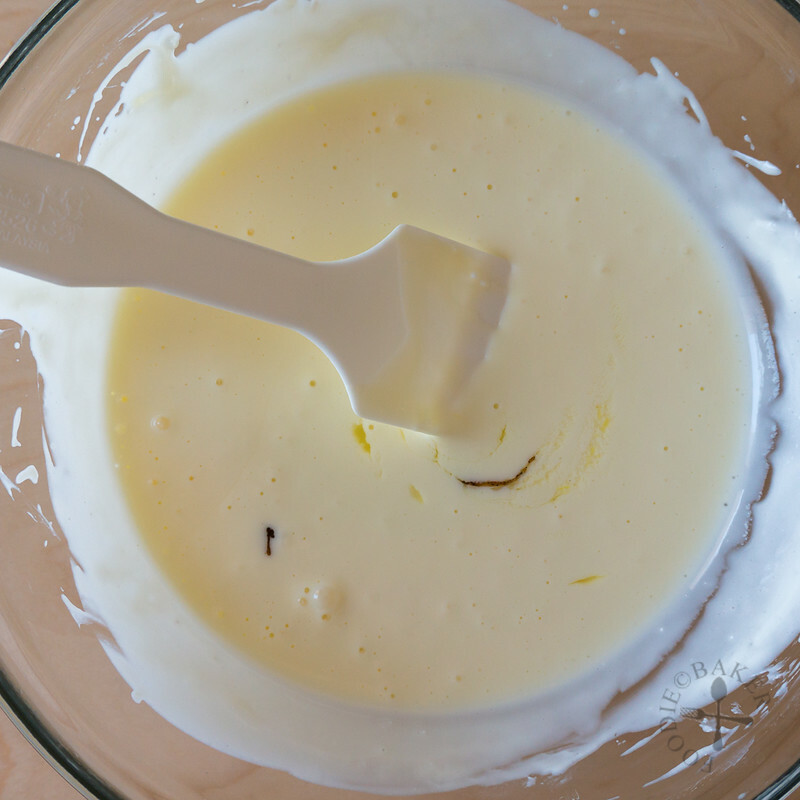 5) Stir in lemon juice and vanilla. 6) Using a fork or skewer, poke holes on the bottom of the biscuit base. 7) Pour in the cheesecake batter. Bake (with or without a water bath, it's up to you) until it's set with a slight wobble. Let cool completely then chill for at least 4 hours or overnight. 8) Combine blueberries (fresh or frozen), lemon juice, lemon zest and sugar in a small pot. Bring to a boil, then simmer for 5 minutes until slightly thickened - it will thicken further as it cools. Spoon the blueberry compote on top and serve! During my first attempt, I baked the cheesecake in a water bath – the top is smooth and not browned at all. 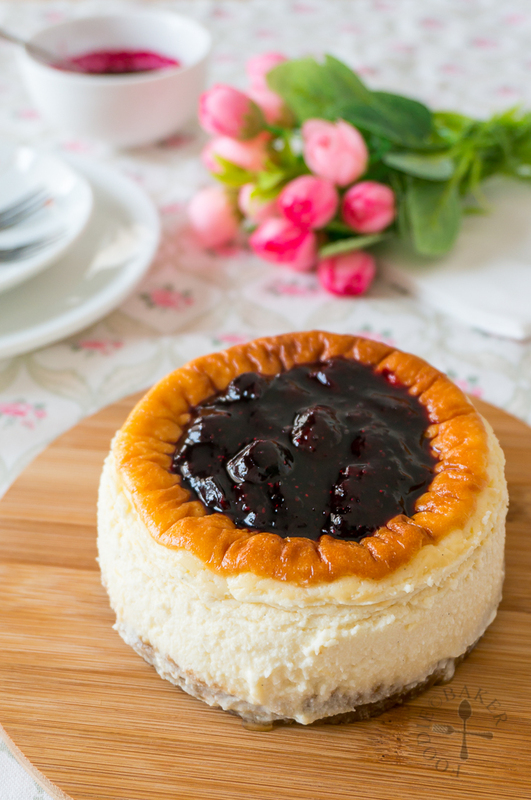 The second time I baked it, I skipped the water bath – the cheesecake rose and browned during baking then sank while cooling, creating a nice cavity to hold the blueberry compote. Place the crushed digestive biscuits in a mixing bowl. Add in almost all the butter and stir until the mixture resembles damp sand, adding more butter if needed. Mix in the cinnamon (if using). 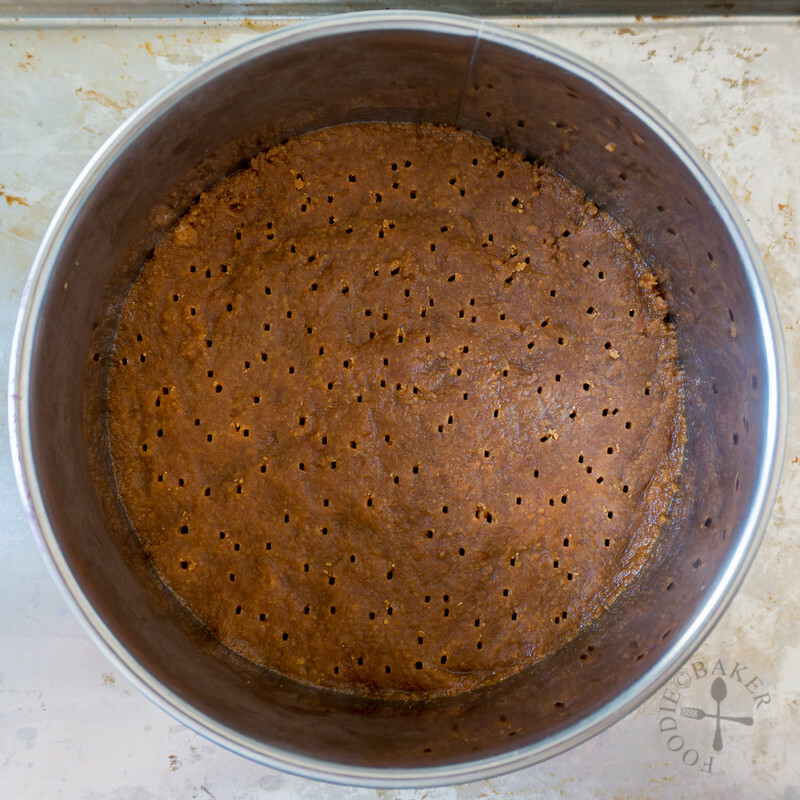 Tip the mixture into a 7-inch round cake tin (springform or loose-bottom) and press down firmly onto the base of the tin. If you plan to bake the cheesecake in a water bath, wrap the cake tin with 3-4 layers of aluminum foil to prevent water from seeping in. Chill in the fridge while you make the cheesecake batter. The crust can be made 1 day in advance. 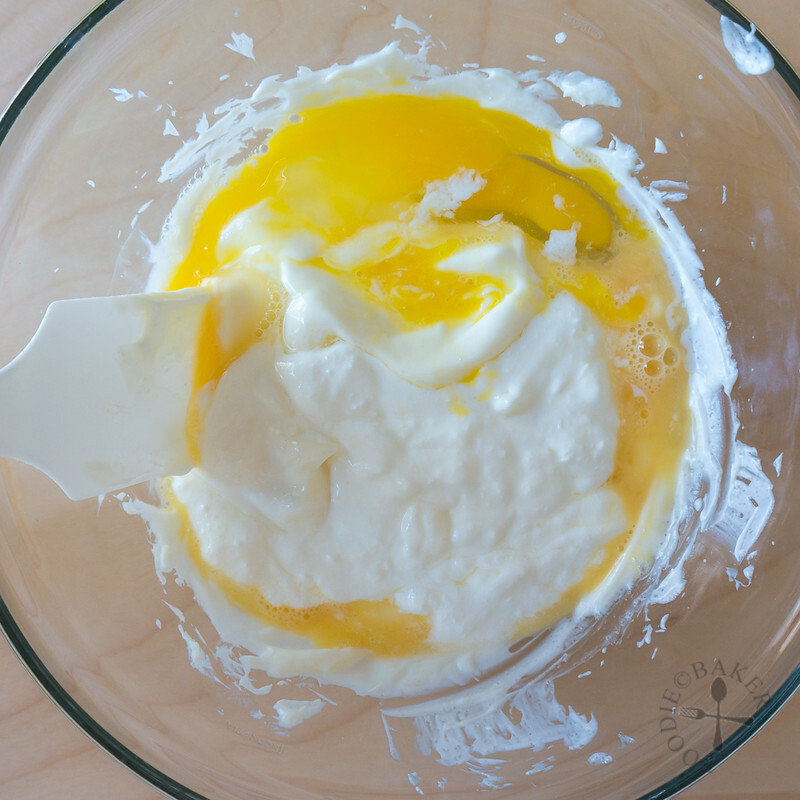 Place the softened cream cheese and sugar in a large mixing bowl. Beat with an electric mixer on low speed for 1 minute to mix them together. Add in eggs and sour cream and beat on low speed for 2 minutes, scrapping down the sides frequently. If there are lumps in your mixture, strain the mixture through a fine sieve into another clean bowl. Stir in the lemon juice, lemon zest and vanilla. Remove the crust from the refrigerator. Usng a fork or a skewer, poke holes on the bottom of the crust. Pour in the filling. 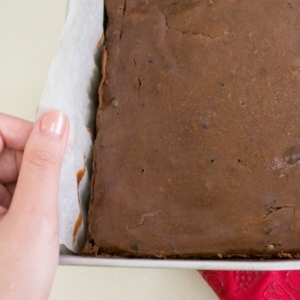 If using a water bath: Place the cake tin (make sure it has been wrapped in several layers of aluminum foil!) in a larger cake tin. Fill the larger cake tin with boiling water until halfway up the smaller cake tin. Bake for 50 minutes to 1 hour until the cheesecake is set with a slight wobble in the middle. Remove the cake tin from the oven and from the water bath (if using) and place it on a wire rack to cool completely. Chill in the fridge for at least 4 hours or overnight. 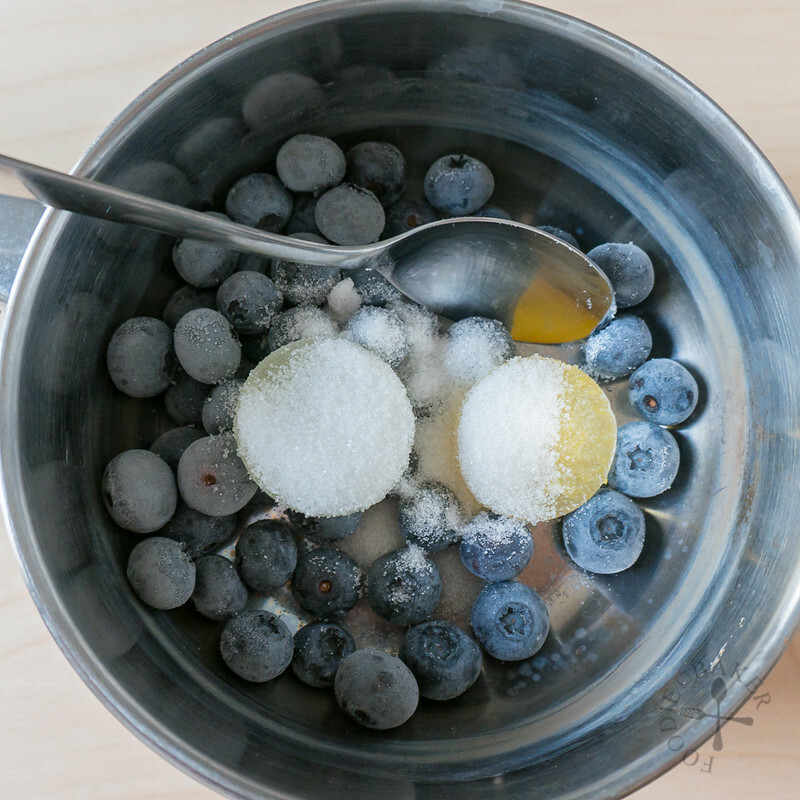 Combine blueberries, 1 tablespoon sugar, lemon zest and a little lemon juice in a small pot. Bring to a boil, then turn down the heat to a simmer. Simmer for about 5 minutes, stirring frequently and squashing the berries, until the mixture has thickened slightly. Taste and add more sugar and lemon juice if needed. Remove from heat and let cool completely - the compote will thicken upon cooling. Run a small knife or spatula around the edges of the cake tin then push out the cheesecake or release it from the springform tin. 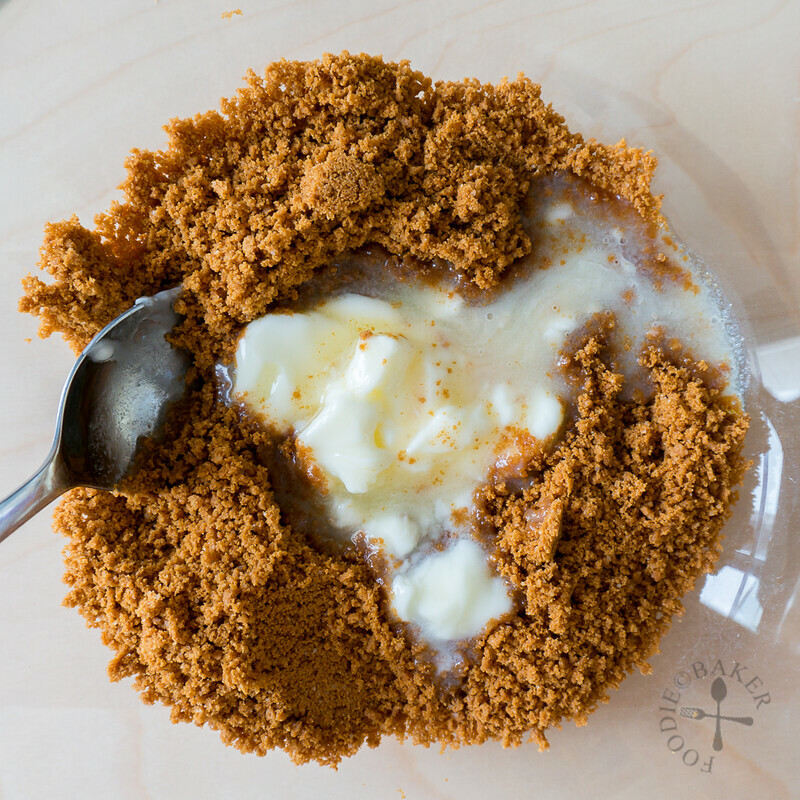 Transfer the cheesecake to a serving plate, spoon the compote on top and serve. To slice the cheesecake neatly, dip a non-serrated knife in hot water, wipe dry, slice and wipe clean. Repeat this for every slice. - To make ½ the recipe, use a 5-inch round cake tin. 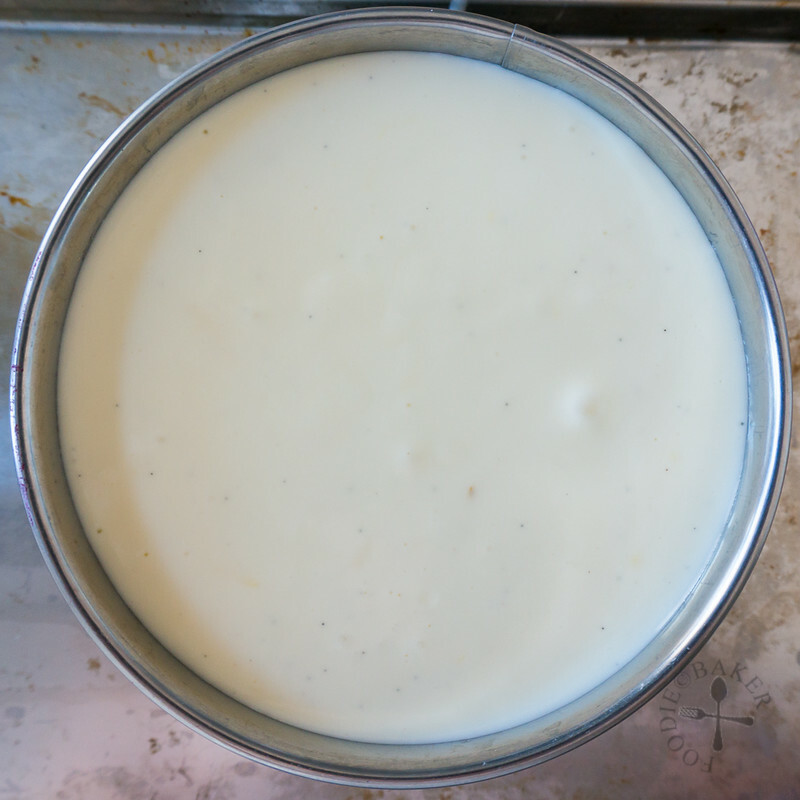 - Beat the cheesecake batter on low speed so that you don't incorporate too much air into the batter. Hi! Just want to ask, what if it will be baked in not water bath? What is the temp and time? Thanks!! Hi Mae! It’s the same baking temperature and time with and without the water bath. I have tried this recipe twice – once with water bath and the other without. You can read about the difference in the recipe! A feast for the eyes! I love cheesecake and this looks fluffy like the Japanese cheesecakes that I love so much. Are you back from your trip? Thanks Bobbi! Yes I’m back… half of me is happy to be back while half of me wish I’m still in Iceland! It’s too beautiful to leave! ooh, Haven’t had cheesecake in forever. 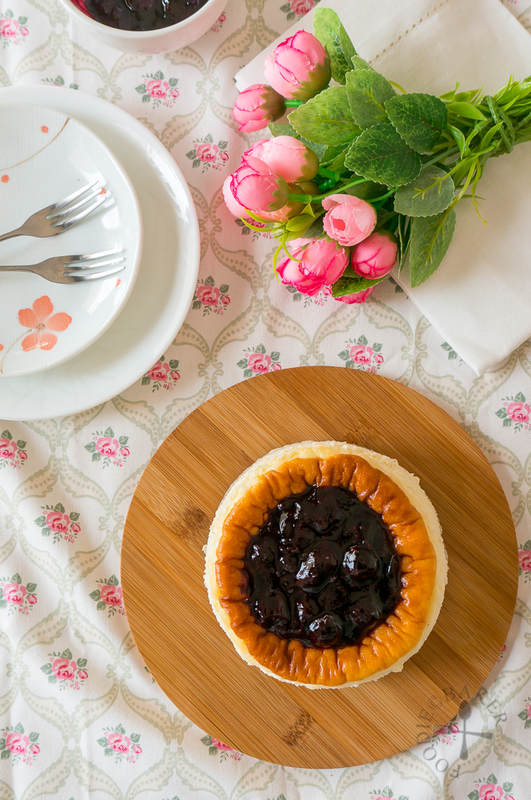 Yours looks so chic with the blueberry compote. Wow baked blueberry cheesecake, certainly a favourite of mine. Love how that turned out, so perfect! I love the small size of your cheesecake, Jasline! Perfect for portion control 🙂 Angie’s right though, I’d probably eat the whole thing myself! Delicious! Seriously, I could finish the whole cake myself! It looks marvelous, Jasline.